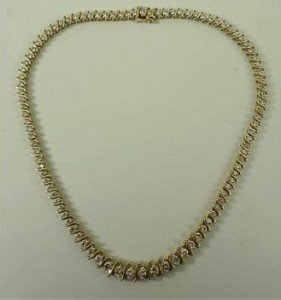 A 14ct gold and diamond necklace, formed in a single chain of ninety eight graduating stones from 0.2ct to 0.05ct, set between ‘S’ shaped links, approximately 7.5ct in total. 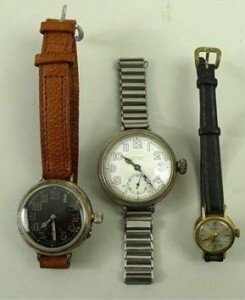 A gentleman’s silver circular cased wristwatch, black dial bearing Arabic numerals, subsidiary seconds dial, back engraved to J M Peto, Coldstream Guards, a Benson silver circular cased wristwatch, white enamel dial bearing Arabic numerals, subsidiary seconds dial, a Bulova lady’s gold plated wristwatch. A Chinese export porcelain sauce boat, late 18th century, famille rose with a Chinese man riding a buffalo, the sides depicting ducks amidst foliage, a twin handled jar decorated with musicians, 11cm high, a 20th century Chinese rice bowl with octagonal rim painted with prunus blossom, 10cm diameter, and another in red, blue and gold depicting flowers. 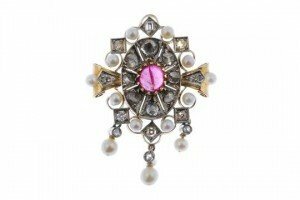 An early 20th century cultured pearl and diamond portrait brooch. 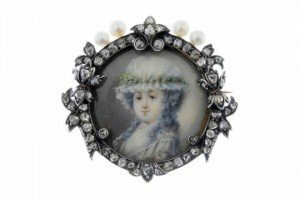 The circular-shape portrait of a woman in period dress, within a rose-cut diamond surround, to the cultured pearl highlights. A pair of emerald and diamond earrings. 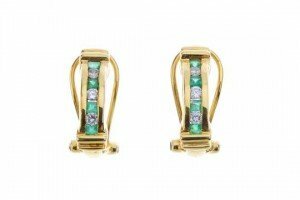 Each designed as an alternating square-shape emerald and brilliant-cut diamond line, within a channel setting, to the double bar sides and hinged fitting. A mid 20th century diamond five-stone ring. 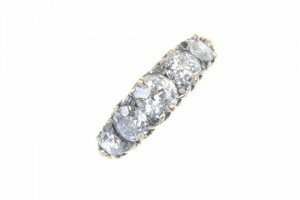 The graduated old-cut diamond line, to the scrolling gallery and plain band. Estimated total diamond weight 2 carats. A sapphire and diamond cluster ring. 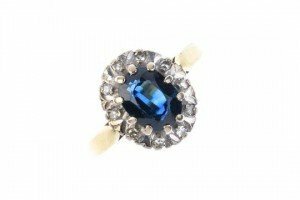 The oval-shape sapphire, within a single-cut diamond surround, to the tapered band. Estimated total diamond weight 0.10ct. A ruby, diamond and cultured pearl cluster brooch. The circular ruby cabochon, within a rose-cut diamond surround, to the alternating cultured pearl and old-cut diamond border, suspending three similarly-set drops. Estimated total weight of old-cut diamonds 0.40ct. A Pair of 18 Carat White Gold Onyx, Diamond and Turquoise Drop Earrings, each comprising three chain linked onyx and diamond clusters, to a turquoise drop, total estimated diamond weight 1.20 carat approximately. 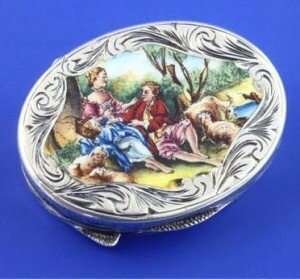 A late 19th/early 20th century Italian 800 standard silver and enamel oval pill box, box with chased scroll decoration and lid painted with figures and sheep in countryside scene. A vintage 20th century canvas and wooden bound steamer trunk with hinged centre and lined interior. H35 x W90 x D53cm. 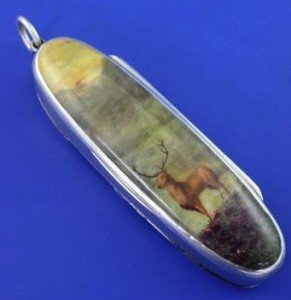 A late Victorian silver enamelled novelty combination vesta case and penknife by Henry Stuart Brown, of oval shape, with two blades and hinged lid with enamelled scene depicting a stag amongst lavender in a highland scene. 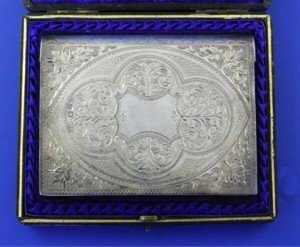 A cased late Victorian silver mounted notecase/wallet by Hilliard & Thomason, chased and engraved with scrolling foliage, with fitted leather compartmental interior and ivory aide memoir. 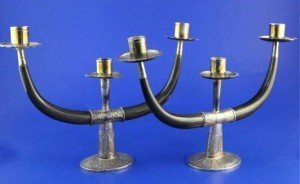 A pair of mid 20th century Eastern silver and horn two branch, three light candelabra, with engraved decoration. 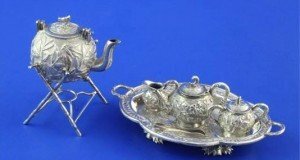 An early 20th century Chinese silver miniature four piece tea set including tongs, a similar two handled tray and a tea kettle on stand, the tea set with prunus decoration and tray decorated with a dragon. 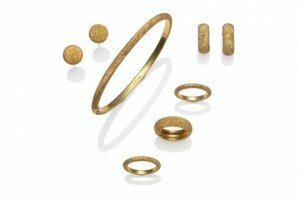 An 18 Carat Gold Bangle, by Links of London, the oval hinged bangle with a frosted finish, along with Three 18 Carat Gold Rings, to match, finger size L, and Two Pairs of Earrings, to match; one pair of studs and one pair of cuff style earrings. 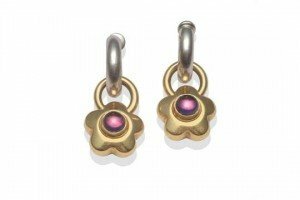 A Pair of Earrings, chunky white hoops hung with yellow daisy motifs each inset with a cabochon amethyst, with sprung fittings to allow the earrings to clip-on. 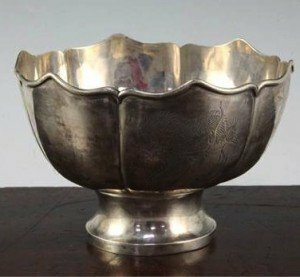 An early 20th century Chinese silver circular rose bowl, with engraved panels including, dragon, bamboo and river scene, signed on foot. 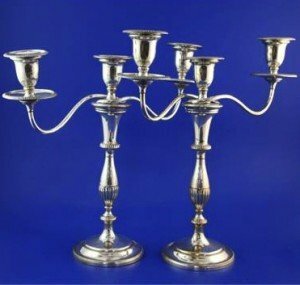 A pair of late 19th/early 20th century silver plated on copper two branch, three light candelabra, with baluster stems and circular bases. 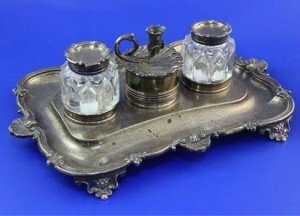 A late William IV silver inkstand by Joseph Angell I & Joseph Angell II, of rounded rectangular form, with shell and scroll border, on scroll feet, with two mounted glass wells and removable taperstick.